Pictured from left, Duncan Rutherford, Sarah O’Neill, Belinda McCone and James McCone. The Godzone adventure race is one of those crazy extreme adventure races and this year it is being held in Canterbury! 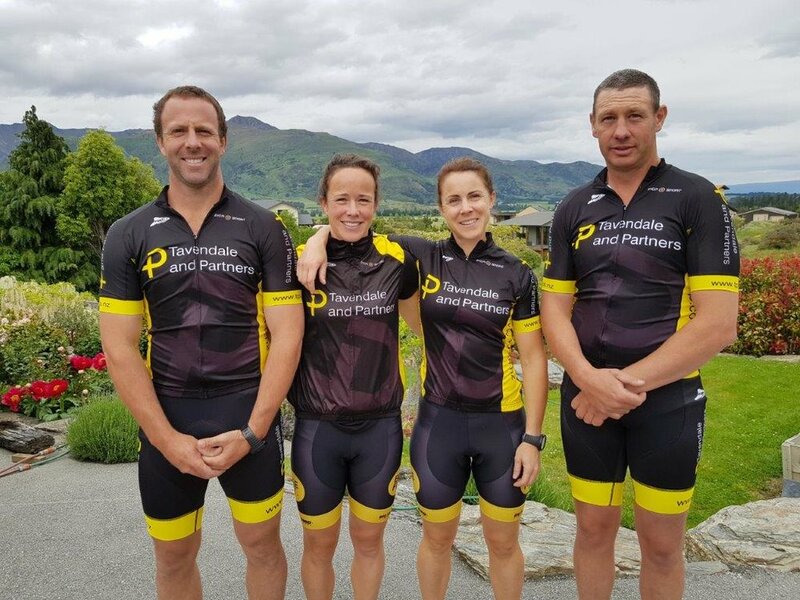 Tavendale & Partners has got behind some hardworking Cantabrians who are taking up what seems like an impossible challenge. The non-stop race is held between 10-17 March 2019 and starts in Akaroa. 47 four-person teams are expected to take between five and seven days to complete the race. The teams navigate their own way around the course using a variety of multisport disciplines including mountain biking, trekking, kayaking and pack rafting. The competitors don’t know where they are going or even when they will receive the race maps. They make their own decisions about when to stop to sleep and eat. This is the second year the firm has had a named team in Godzone competition but this year there are some fresh faces – all from one of the practice’s farming family clients. Belinda and James McCone are being joined by Belinda’s sister Sarah O’Neill, and her brother Duncan Rutherford. The Tavendale Godzone team obviously has spent a great deal of time in the great outdoors. Belinda, James and Sarah have done three 24-hour races previously, with Duncan completing his first one late last year. Belinda and Sarah have also done the Coast to Coast race about 15 years ago. Training has included a 12 hour race in Twizel last weekend where they had the opportunity to practice all the challenging disciplines and were also able to do a mini-Godzone mock race in St Arnaud earlier in the year when six Godzone teams did a 36-hour training race. For that race however, they only had three team members. “My husband James broke his ribs falling off his mountain bike in the new year so he wasn't with us for that race, and he does most of the navigation,” said Belinda. The team were happy with their performance, and their improvement since. James is now fully recovered, which is just as well as you wouldn’t want to start this race nursing any injury. Mark was keen to encourage the family in this extreme adventure race by sponsoring them. “It is a good mix for us with the other things we sponsor, such as cycling and show jumping,” he said. “We like to support the people who do the hard yards!" Now the race is getting closer, Belinda did admit that everyone was “exceptionally nervous!” There is also a great deal of excitement and the whole firm wishes them all the best of luck. There are changes to the Anti-Money Laundering and Countering Financing of Terrorism Act 2009 (“AML/CFT”) that will apply to you + us. You may already be aware of AML/CFT as the law currently applies to banks and other financial service providers. From 1 July 2018 AML/CFT will apply to your relationship with us. From 1 October AML/CFT will also apply to your relationship with your accountant and any Real Estate Agent that you deal with after 1 January 2019. The law reflects New Zealand’s commitment to the international initiative to counter the impact that criminal activity has on people and economies within the global community. From 1 July 2018 we are required to have measures in place to help us to detect money laundering and financing of terrorism as the services we offer may be attractive to those involved in criminal activity. As a law firm we need to assess the risk we may face from the actions of money launderers and people who finance terrorism and identify potentially suspicious activity. To make that assessment, we need to obtain and verify information from existing and potential clients before we start providing our services to them. This is known as “customer due diligence”. Customer due diligence requires us to undertake certain background checks before providing our services to you. We must also take reasonable steps to make sure the information we receive is correct. To do this, we need to obtain information from you and verify the information you provide us is correct. To confirm these details, we will need documents that include photo identification, like your passport or current driver’s licence and documents that show your address, like a current bank statement or utility bill. If you are seeing us about a company or trust, we will also need information relating to the company or trust and the people associated with it (such as directors and shareholders, trustees and beneficiaries) and we may also need to ask you for information on the source of funds and wealth for a transaction. We will make this process as easy as possible for you by providing you with detailed guidance on what we need. If you cannot provide the required information? If you are unable to provide the information we require, it is likely we will not be able to act for you. Because the law applies to everyone, we need to ask for the information even if you have been a client of ours for a long time. Please contact us if you have any queries or concerns about these requirements. The recent High Court decision on liability for defective buildings emphasizes that it is virtually settled law that building contractors may face tortious liability for commercial or public buildings unless their contract expressly excludes it. This begs the question as to how a contractor can limit or exclude its tortious liability for a commercial construction project. The case involved Hawkins, which was contracted to build school buildings for Botany Downs Secondary School. The buildings were constructed with defects and did not meet the Building Code (Code). The Board of Trustees (Board) and the Minister of Education (Minister) claimed Hawkins owed them a duty of care to construct the building exercising reasonable skill and care and ensuring compliance with the Code. They claimed Hawkins was negligent in failing to meet that duty and therefore liable to meet the costs to remedy the defects – some $17 million including GST. Hawkins argued unsuccessfully that it did not owe a duty of care to the Board or the Minister and so couldn’t be liable for the cost to repair the building to meet Code. Hawkins said this was because the terms of their contract excluded such liability. However, when the Court looked at the contract, it held that there were no such terms that expressly or impliedly excluded liability in tort or that were otherwise inconsistent with imposing tortious liability. The Court did however confine the tortious duty to compliance with the Code and not to other quality requirements under the contract. While residential construction contracts often contain terms limiting the contractor’s liability, the Building Act and Consumer Guarantees Act ultimately prevent exclusion of liability anyway. In the commercial context, it is possible to negotiate an effective exclusion or limitation of liability, but it is difficult, and the default terms of industry-standard commercial construction contracts don’t include these. Most principals won’t accept a contractor having limited or no liability if the building works don’t comply with the Building Code. However, if the principal and the contractor have equal bargaining power – say, if the contractor has no competitor able to complete such a complex project, or the principal has particularly onerous construction or design requirements, or the parties have a very close working relationship – the contractor may be able to negotiate a limitation or exclusion of tortious liability. If, through negotiation, a commercial construction contract does limit or exclude general liability, it’s important for a contractor to ensure that the exclusion/limitation of liability expressly captures tortious liability. Otherwise the contractor may still be exposed. Usually, the statutory time limit for a claim in contract expires before the time limit for a claim in tort. This often means principals can only sue a contractor for defective construction in tort – if the contract doesn’t expressly prevent this. While errors and omission (“E&O”) / defective construction insurance cover is available under business policies (for an additional premium), such cover is usually limited and is unlikely to meet all tortious liability costs. It’s far better if a contractor can limit or reduce their tortious liability in the commercial construction contract itself. Minister of Education & Others v H Construction Ltd (formerly Hawkins Construction North Island)  NZHC 871. Hawkins had argued no such duty of care existed in the context of construction of a non-residential building. However, the High Court had little trouble disposing of this argument, treating the law as now relatively settled that a builder (and territorial authority) owes a duty of care in the construction of a commercial building. This is because the statutory limitation period for a claim in contract generally runs from the date of the breach of contract (which is likely when defective works were physically carried out) whereas the limitation period for a claim in tort runs from the date that damage or loss accrued (which may be when the building suffers damage because of the earlier defective works). Orders made by Mycoplasma bovis response officials are open to legal challenge and farmers seeking interim measures while issues are resolved are being urged to pursue legal options. Driven by concern, Canterbury law firm Tavendale and Partners has put together a dedicated team of agri and dispute resolution lawyers to respond to the “M bovis crisis”. The lawyers say farmers need every option possible to preserve their livelihoods given the recent explosion in M bovis activity combined with the lack of Primary Industries Ministry transparency and leadership. A blow-out of infected and at-risk properties, described by ministry officials last week as “game changing for the cattle disease response” has escalated industry concern that cattle are going to slaughter in vain. The number of infected properties is now 38 with another 77 under restrictions because they are considered highly likely to be infected and 225 under notice of direction. Almost 1700 properties are tagged as “of interest”. But MPI is still forging on with its order to kill 22,000 cattle. Almost half of them, 53.9%, across 18 farms will be culled by today. MPI told the primary production select committee at Parliament on Thursday developments in the previous six days had been a game-changer in terms of the jump in farm numbers under question and the spread of the disease. “The spread of the disease has gone totally above all expectations in modelling,” Biosecurity NZ head Roger Smith said. Testing is ongoing in both the North and South Islands and MPI expects there will be many more infected properties. Primary Industries Minister Damien O’Connor told Farmers Weekly on Friday eradication remains the focus but doing it in the short term was now out of the question. “Short term, it’s not looking possible now but the longer term is still an option. “There is a lot more possible spread than we can ascertain at this stage. “It would be dishonest to say we know how many infected animals there are and that we can cull them all immediately. “We are still identifying farms and getting closer to making a decision on the best direction going forward,” O’Connor said. Meantime, affected farmers should act quickly if they want to contest MPI orders on movement restriction and the culling of their cattle. Specialist disputes lawyer Kirsten Maclean said despite orders being directed by a government agency they are still open to challenge by judicial review. “There is still ability to challenge the policy and farmers can do this as a group or as individuals. “You can’t unkill cows but applications can be made for urgent preservation of the herd while substantive detail is sought,” Maclean said. The only real mechanism to challenge a cull or movement restriction order is through the process of judicial review in the High Court. Challenges would likely be on the grounds of unreasonableness. An application to judicially review a cull notice can be accompanied by an application to the court that the cull be put on hold pending the court’s decision. If it can be established that there is an arguable case that a wide-ranging cull order is unnecessary to achieve MPI’s aims of eradication then interim relief might be granted pending analysis of the substantive issues. One of the considerations of the court in any judicial review is the public interest in eradicating the disease. “However, we believe there are options open to farmers who wish to challenge aspects of this process,” Maclean said. The key is to act quickly, agribusiness lawyer Tim Silva said. For compensation disputes, arbitration is the way to go. It can include whether to grant compensation at all or a dispute over the amount that should be paid. Silva said the key benefits of arbitration include the chance to select arbitrators with industry knowledge with the process faster than the court process. He believes the hard work on compensation is yet to come. “Based on value at stake very few claims have been processed at this point. “We are dealing with the chicken feed claims – the real losses of farmers losing their herds is yet to come, that’s when the heavy lifting starts. “And that is a real concern given how compensations are going so far,” Silva said. The lawyers encouraged farmers to act quickly on exploring legal options to protect their interim position. The Labour Inspectorate is calling for dairy farmers to get it sorted with compliant records, employment agreement, and all employees receiving at least their minimum legal entitlements, including at least minimum wage for every hour worked. In its media release, the Ministry of Business, Innovation and Employment stated its recent investigations had found 28% of farms were failing to meet their record-keeping obligations, resulting in $11,000 of fines. While MBIE says the statistic is an improvement, the reality remains that no employers should be failing to meet the basic minimum requirements of New Zealand employment law. Minimum requirements include keeping good wage, time, holiday and leave records, having compliant employment agreements and ensuring all employees have the correct VISAs to be working in New Zealand. Farmers also need to ensure they are paying employees all their legal entitlements such as for working on public holidays and receiving at least minimum wage for every hour worked. It’s not ok to pay a weekly salary and hope that quiet times of the season balance out the busy times. Employers need to ensure employees are paid at least the minimum wage per hour for every hour worked in each pay period. Labour Inspectors will be visiting more farms in the coming year and MBIE’s messaging is that any farms “that are found not meeting their employment obligations can expect to face serious consequences”. For more information about your obligations as an employer in the agri sector, and how to comply with them, please contact one of our employment team. We can also assist you through the process of an inspection if the Labour Inspectors call upon you.